For the uninitiated – or the unimaginative, perhaps – an exhibition of quilts in a village hall on the Northants/Bucks borders probably conjures a vision of tradition and both a literal and a metaphorical cosiness. As a non-practitioner of quilting, I can only say that anyone visiting with such an expectation would have been disappointed, and beautifully so. In exploring the shared exhibition theme of ‘Journey’, the five exhibitors had clearly taken their subject to both heart and workshop table not just literally or metaphorically, but personally too. And their sense of expedition and discovery was one that the visitor could also share. I’m not going to use the ‘c’ word in this review – by which, of course, I mean ‘craft’ – as this impressed me as being much truer in execution to their own phrase: textile art and design. To borrow from their own metaphor of travel in its broadest sense, the quilt as seen here is not simply a traditional or heritage artefact but a vehicle – for experimentation and for expression. As a music maker – the relevance of which may become more apparent in the reaction to one displayed piece – I found myself unexpectedly thinking of the Bristol band, Portishead: a thought that probably requires some explanation! Traditional quilting is, to those unfamiliar with how far it has travelled as a form, concerned with creating a greater whole from available existing scraps: upcycling to borrow a fashionable phrase. In contemporary music, pieces are often constructed from ‘samples’ – existing sonic scraps – in much the same way. So why did I think of Portishead? Because I was aware of one aspect of the band’s technique: wanting a particular sonic sample – a scratch vocal that would evoke memories of old 78 records, for example – and, realising that it did not exist, creating it so it could be ‘sampled’ and incorporated. Contemporary textile art takes a similar approach: the pieces here not only used techniques that my shallow knowledge of art history recognise as bricolage – incorporating and collaging together a range of materials and sources – but an inventiveness in the creation of individual elements as much as the completed whole. Fabrics – in a huge array of textures, materials, colours and opacity - have not merely been found and sewn together, but printed (by a wide range of methods and techniques), felted, dyed, painted or stained, stencilled, quilted or stitched by hand or by machine. In terms of inventive applications of available technologies, the display was as contemporary and fearless as an experimental hip-hop album! Not that this was a show of mere technique: the quilters’ chosen interpretations of their common theme were surprising too. Ann Beech’s quilts offered not just interpretations of literal journeys – a shimmering piece inspired by a rain-swept journey through the reflected neon of Leeds city centre, and a St Ives sunset that was inspired not just by landscape but by the work of the painter Wilhelmina Barns Graham, a leading member of the St Ives School of artists – but a life journey. 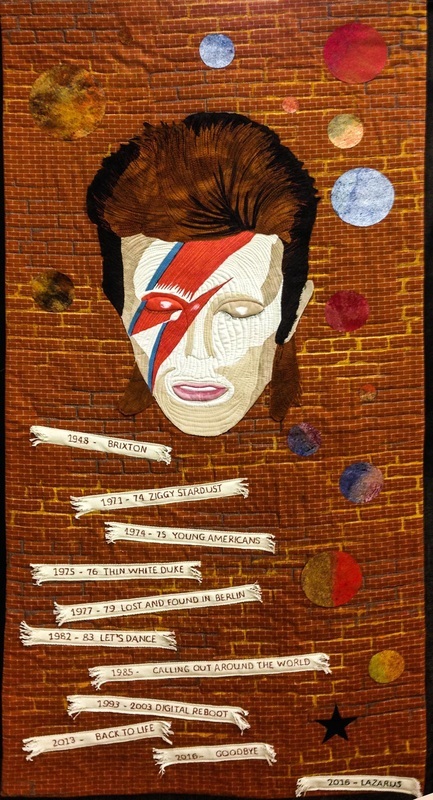 Ann’s “Journey through the Life of David Bowie” incorporated the iconic Aladdin Sane image of the late singer, the lightning flashed rendered in silks, into a piece that appeared at first glance like a modernist miners’ banner: mining not coal but the milestones of an iconic figure. Sarah Shower’s pieces took us to Scotland, and to its landscapes of the subtle hues of birch bark and of nature reclaiming abandoned villages. Her heavily hand-stitched batik inserts depicting the colouration of silver birch bark were one of many pieces here that used texture to telling effect, the hand stitched weeds in her “Abandoned” quilt were almost three-dimensional in their combination of surface detail and vibrant colour. 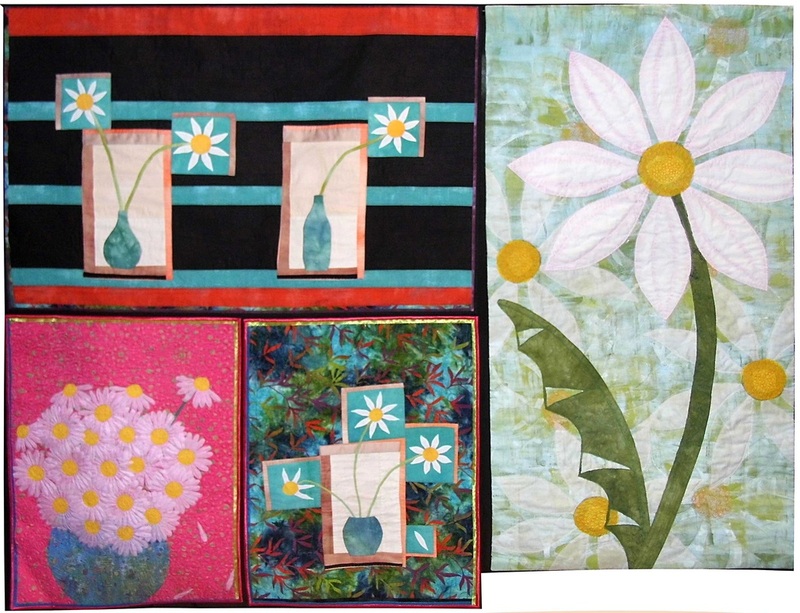 Sue Turner’s series of quilts on the theme of daises sent my head scurrying to a different section of its mental Art History library, and the Pop Art paintings of Patrick Caulfield and Julian Opie in her bold use of geometry and block colour. Kath Gunn’s work took us on a global journey – to Italy, South Africa and India, incorporating imagery (of fruits, flowers and Ayurveda symbolism) and fabrics that resonated with these different locations. The rich greens and golds of the dyed and printed silks of her “Journey to Italy”, with its imagery of fresh figs, captured not just the lusciousness of the fruit but the rich sensuality of late summer in an Italian garden. Imagery played a different and unexpected role in Jill Stillman’s quilts, which gave us several hundred years of social history in tracing the Black journey from African village to the White House through the history of plantations and slavery, the Civil Rights Movement and the election of Barack Obama. And there was a history lesson of a second kind here, in the symbols used by the Underground Railroad – a secret network of safe houses used to guide slaves to liberty from Deep South to North – and documented in quilt designs of the era, using patterns as a vital means of communication to those who would probably be unable to read or write. A Journey? Yes, indeed, and one into the unexpected where the simple practicality of an object of generosity – a quilt – can bring us everything from daisies and gorse to Martin Luther King and Rosa Parks. They say that travel can broaden the mind: I’m happy to say that an exhibition of quilts can have the same effect!